The bathroom in the home has become a leading space for design, where a variety of materials, textures and shapes can be included to make it look spectacular. The furniture, colours and finishes create the concept and ensure that is to your liking and preference, cherishing each and every detail that it is composed of to make the bathroom perfect. The shower is perhaps one of the most important areas in the bathroom and at times does not receive a great amount of attention. How can you make this area look amazing? 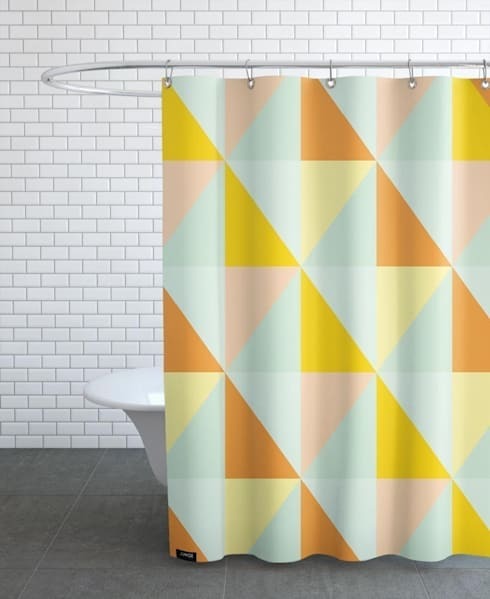 In this Ideabook, the homify team have compiled seven great ideas for your shower space, making it the centre of attention; from a simple curtain to spectacular finishing elements, you will have everything you need. A shower that is fully covered by glass shower doors has a particular charm. This creates an elegant, light and airy shower and usually belongs to modern spaces, where the priority is in order of light and simple lines. In a case where there is a bath too, as seen in this image by Dream Architecture, it is well worth it to highlight the finishes and coatings of the walls and the floor; as well as the textures and forms that give warmth to the space volume, creating an enjoyable space with the presence of the glass door in the shower, which provides an elegant touch. If you want to highlight the details of your bathroom, do not hesitate to include a clear glass door for your shower, it is the most elegant way to not saturate the space and allow each item in your designer bathroom look stunning. 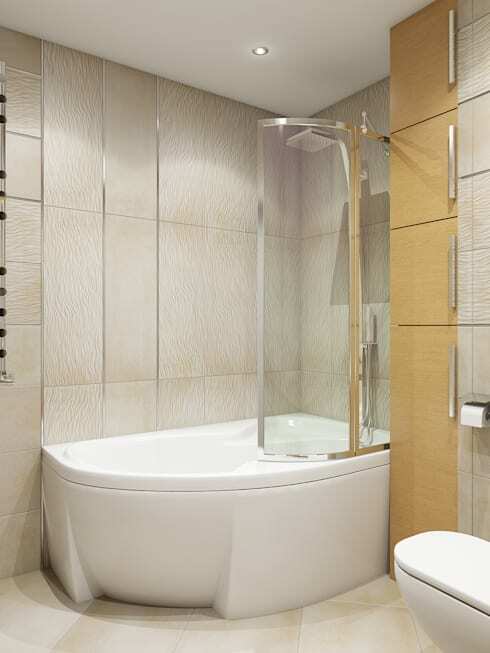 Plastic screens or partitions are widely used as a door for the shower area and are cheaper than glass, very durable and a great choice for inclusion in bathroom decor. In this design by Tatiana Zaitseva Design we can see an original to take a shower, away from the traditional straight lines, this creates a small cabin that gives us a feeling of privacy when bathing. Another advantage of plastic screens is that you can include variety of colours and tones in your design, so you can achieve a joyful and colourful space and above all quality and safety. Vinyl has the ability to radically transform spaces. It is easy to use and there are a variety of designs on the market, the best thing is that they are not only used on the walls of the house and can lead to a stunning bathroom design that is both discreet and elegant. In this example by Studioviro the shower is covered by a transparent glass, creating some privacy is the strategic position of this white vinyl that simulates a cloud of steam or a few drops of sprinkled water. A bathroom where simplicity and elegance are the defining characteristics, yet it is discrete and deserves to be chosen as a means to complete its decoration. The easiest and cheapest way to hide the shower and create a private atmosphere is through a curtain. Using this element, we can make multiple combinations of colours and designs as it is frequently interchangeable, constantly renewing the appearance of the bathroom. Simply measure the size of the shower and look at various shades that allow us to create different effects; from cheerful and fun to neutral and sober. In this example we present a geometric design by Juniqe that achieves an interesting effect of very interesting that almost seems to move while highlighting the freshness to the white that dominates the room. 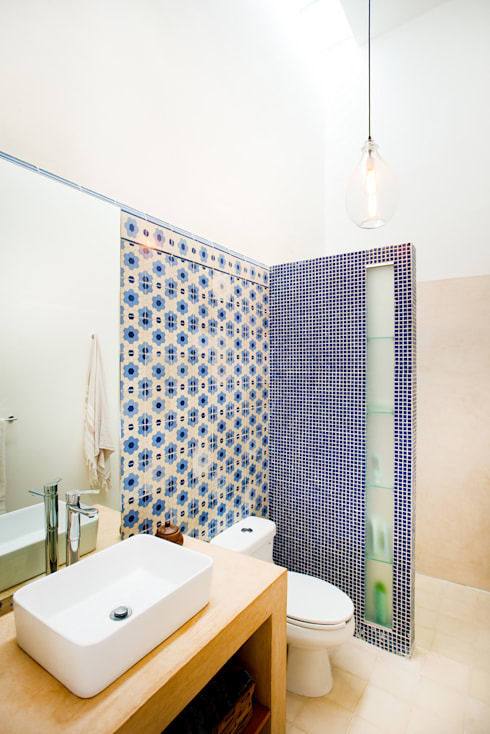 This shower is partially hidden by a delicate wall that is covered in small tiles, giving a nostalgic and retro design by the team at Workshop Style Architecture. This wall provides an organised approach to the bathroom facilities which we need to use during bath time, by means of shelves covered with glass that make it lighter and more charming. Is it a door? A curtain? No, it's just an architectural detail that lends a timeless decor with a retro touch when combined with the other side of the wall containing a large mirror and a romantic flowers that is formed by more mosaics. The tiles or mosaics are traditional pieces used to coat the walls of bathrooms, allowing for easy cleaning and durability against moisture; and depending on the style you choose to use, you can choose your personal preference. Need more inspiration? Then check out: Which Floor For Your Bathroom? Stone is an element that gives a unique personality to the spaces in which it is included in, it is a great choice for a bath if we want to add a rustic touch. We have several options to consider, when we decide to use the element in our shower, from the most rustic and natural to more modern designs that retain a classic spirit as seen with the use of marble in this bathroom by Passage Citron. The coating of the tub and shower in beautiful stone achieves a mixture of styles between rustic and modern, which is reinforced with other elements for decoration giving warmth and comfort to the bathroom this is emphasised by the plush carpet and distressed wood table. What if we do not add anything extra? This is also a fantastic option. Depending on the layout of the bathroom, we can dare to let the natural elements be the designer aspect. For this, we should consider a bathroom with ample space running to the floor from the shower or bath (or even both) to allow for better drainage in an effort not to flood the bathroom. 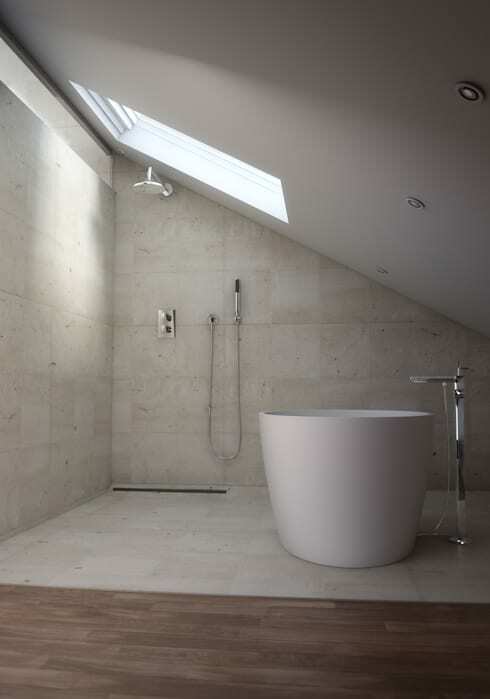 We must also be careful in the design of the materials design and look out for those that best resist moisture, in this case we can see a minimalist bath where straight and simple lines, colours and a skylight create a unique design by Lemons Bucket. Are you looking to upgrade your shower and make it a feature in your bathroom? We'd love to hear your plans in the comments!